In this book, John Wood describes how he went from being a manager at Microsoft to the founder and director of Room to Read, a charity that builds libraries and schools in developing countries. 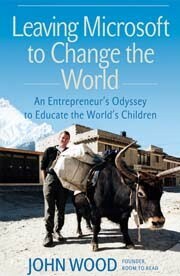 It's an easy and fun to read book about how he sets out to improve literacy for ten million children by 2015. He seems very successful in his endeavors and has achieved to set up 1128 schools and 10.000 libraries, benefiting 4.1 million children thusfar. Being advisor on Planning, Monitoring and Evaluation, I read this book with scepticism. Who was this businessman coming into the world of development aid, claiming that he was the first to do something substantial against illiteracy? Weren't there not tens if not hundreds organizations already working on this? Yes, there are. But honestly speaking, not many have achieved to work in nine countries, providing access to millions of children to books and doing all of that with private funding. So how about the results he mentions? For organizations that receive government funding or funding from international donors, it's usually not enough to merely state what the outputs or direct results of their activities are. So, they cannot just say that their 'impact' was 8944 scholarships for girls. The scholarships are just the outputs. They actually have to try to prove that the scholarships helped girls gain knowledge which they use when they grow up. Are these organizations going to far in trying to measure this impact? Should we just work it in a more businesslike way? Apparently, the information that Room to Read is providing is enough to generate more and more funding each year. That's the way the market works, right? One thing that stood out for me was that he only sporadically mentioned a project that wasn't very successful. Does this mean there weren't many? Or does it just mean he doesn't want to (as we say in Dutch) hang out his dirty laundry? From what I can tell, many projects in development aid are not as successful as planned and hoped, because reality always seems to pose new problems. I would be interested to hear more about what happens in the kitchen of Room to Read. What's their secret recipe? Despite my critical outlook (mostly about the idea that development aid is just a thing you do on your gut feeling), I feel that the development aid community can learn a lot from this businesslike way of doing things. One element is the personnel you hire: Yes, we all work towards a common goal, but that doesn't mean that anyone who just wants to do good can be on the team. In order for it to work, organizations need committed professional staff. Furthermore, ownership of the local communities needs to be ensured. So without a contribution from the schools, parents or village chief, there will be no Room to Read library or school. To end off on a light note: There is a vacancy with Room to Read for which the requirements are listed below. First of all, I note that professional experience in development is required. This means that 'this businessman' does surround himself with knowledgeable people. Secondly, I find the last requirement hilarious! I suppose Microsoft sponsors the software they use. No Macs allowed. With or without reading this book; please go out and change the world! Indonesia, Indonesia - "But you're so bule!"